I have had the good fortune of meeting Persephenie Lea who is as beautiful on the inside as she is on the outside, and I love supporting her small business. She hand-crafts her skincare and fragrances in small batches, and uses only the highest quality ingredients. Some of her perfumes are “mixed media” so not all of them are 100% natural, but her body care is, and include the frequent use of organic botanicals. I have been a longtime fan of her Jade Camellia Organic Body Balm, as its scent is uplifting and relaxing at the same time. The following notes might sound super energizing, but I find this balm to be very soothing (for both my skin and mind) when used before bedtime. Fresh lime and ginger are clearly zesty aromas, but when merged with mimosa, the end result is slightly piquant and sweet with a very subtle nutty-wooody quality. At first sniff, Jade Camellia reminded me of linden blossom, with its honeyed-soft sweetness. For those of you who are crazy for high-end packaging, you will be pleased that the jar heightens the experience of this healing balm as the black glass has a luxe look and feel. 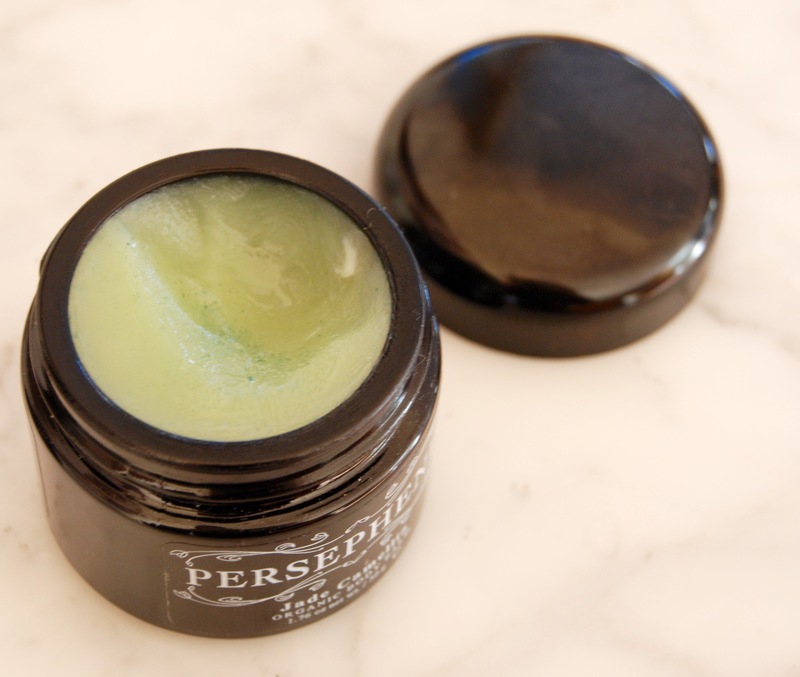 You will notice the lovely sea green color of this balm, which I’m assuming is imparted by Spirulina maxima (a blue green algae) and is purported to stimulate cell regeneration and self repair. Pomegranate seed extract is also present, and has the same healing profile. As the name of the balm suggests, camellia oil is in the mix which is high in oleic acid and is incredibly moisturizing and has anti-inflammatory properties. Because Jade Camellia has a salve-type consistency, I prefer using this at night for some extra TLC on my dry hands, especially when I want to drift off to sleep amongst a unique fragrance. 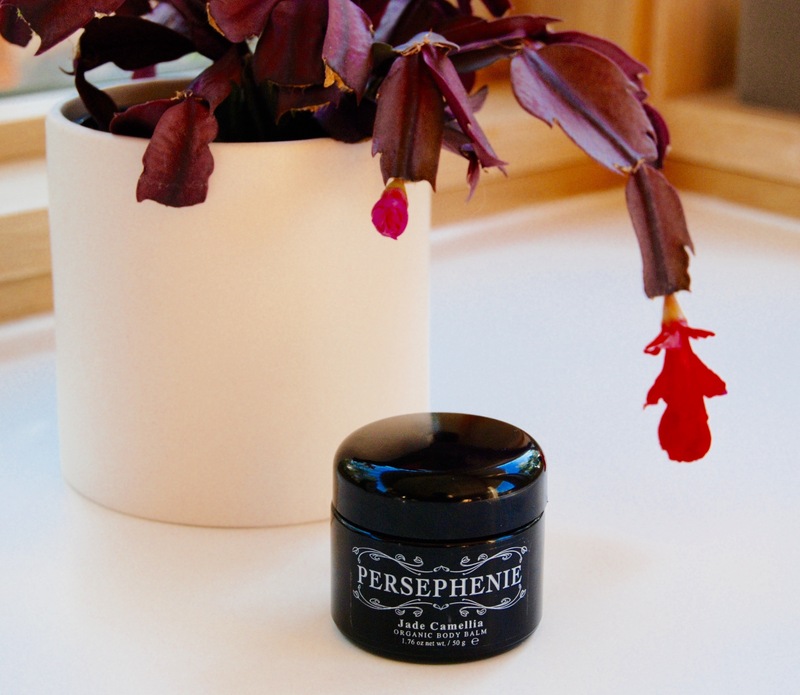 Please explore Persephenie’s full line of body care on her website, there are many things to fall in love with. Ingredients: Certified Organic Sunflower Oil (Helianthus annuus), Organic Camellia Oil (Camellia oleiferra), Organic Beeswax (Apis mellifera), Organic Shea Butter (Butyrospermum parkii), Organic Pomegranate (Punica Granatum), Vitamin E, Blue Green Algae (Spirulina maxima), blend of botanical essential oils and absolutes. Disclosure: I bought this at Beautyhabit.com. All opinions are expressly my own. Thanks! It is nice anytime of year, but yes, a special treat in the cold weather! This sounds lovely. So glad you are back!